Spotted this on the 5.14pm Epping train. if you don’t arrive at your destination on time please inform our friendly station staff and we promise to refund you the cost of your journey if we dont (sic) deliver the service we promise why should you pay full fare? 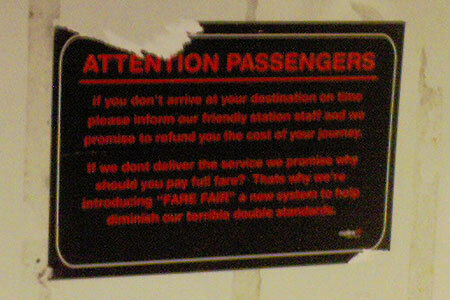 Thats (sic) why we’re introducing “FARE FAIR” a new system to help diminish our terrible double standards.